Richard has a really nice article on the evolution of the 'Tuckaway' on his website that is well worth reading (his writeups are so thorough, and the model went through some very interesting design changes over the years). My particular model is a first year model (from 1940) that came with a 14K gold-filled cap and barrel, and a personalized engraving --- "TO ROSE FROM FRANK 1942". 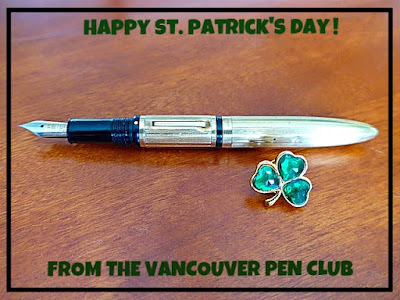 Unfortunately, I don't know who Rose & Frank were, but I'd imagine that this little pen was not inexpensive (given how especially valuable gold was, during the war years). The thoughtful inscription adds that personal touch...and makes the pen even more special to me. 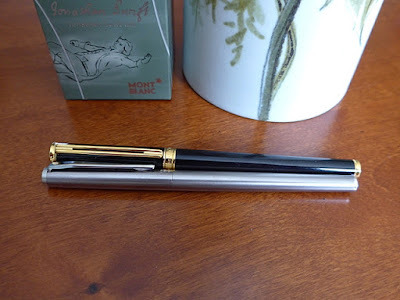 I also recently bought a new Montblanc (MB) from an excellent seller ("Archimark") on Pentrace---the same seller who sold me that wonderful new Signum 'Nova' in Cinnamon colour earlier this year. This new MB is the stainless steel Noblesse Slim Line pictured next to its younger cousin, the black Noblesse Oblige I got from my in-laws several years ago (good article on the two pens here on Penhero's very informative-and-gorgeously-illustrated site ). 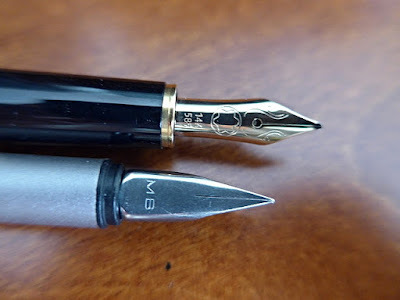 The Slim Line has a wonderfully-smooth Fine steel nib and is a very well-made (I counted and it takes 12 full turns to unscrew the section from the barrel!) cartridge-converter MB model. 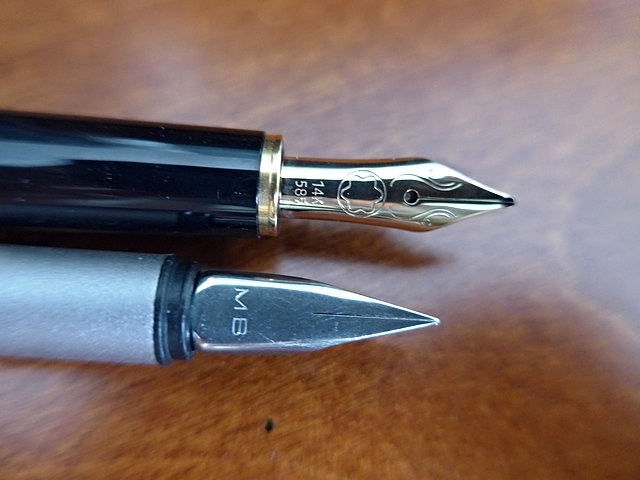 A closeup shot of the two nibs----the Noblesse Oblige's 14K gold nib, and the Noblesse SlimLine's steel one. Many thanks to the Binders (Richard & Barbara) and Mark ("Archimark" on Pentrace) for my two new wonderful fountain pens!